Rung on the back five by an all local lady’s band to mark the centenary of ‘The Representation of the People Act 1918’ receiving Royal Assent on 6th February 1918, which gave women of property over the age of 30 the right to vote for the first time. Women achieved full equality regarding suffrage in 1928. First quarter peal on the bells by an all lady’s band made up from the local band. 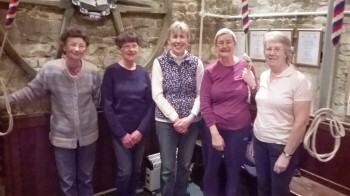 First proper quarter as conductor (having to put bobs in, instead of just counting extents of Minimus), Well Done Yvonne, Tower Captain here at Potter! Lady's Quarter Peal Band in order: (L-R) 1. Janet Crafer; 2. Janet Risdale; 3. Jayne Palmer; 4. Sr Maureen Pike; 5. Yvonne Woodcock (C). Last updated Tuesday, 6 February 2018 at 23:49:26. First submitted Tuesday, 6 February 2018 at 21:44:09 by Christopher C P Woodcock. Sent for publication in The Ringing World on Tuesday, 6 February 2018 at 22:02:28, and printed in issue 5575. This performance has been viewed 580 times.